UPDATED: Sat., Feb. 24, 2018, 8:38 p.m.
PALO ALTO, Calif. – It was the offensive game they’d been searching for, with efficient shooting, acute passing and scoring from just about every position on the floor – the bench as well. But the Washington State Cougars also had to relearn an old lesson Saturday afternoon at Maples Pavilion. It’s mighty hard to win in the Pac-12 when you give the opponent bonus chances to score. Between 23 second-chance points and 18 points off turnovers, Stanford had more than enough help from the Cougars. But if it demonstrates how well WSU played in a losing effort, the Cardinal led by only two points when Malachi Flynn’s stepback 3-pointer sailed into the air and short of the rim in the final seconds of Stanford’s 86-84 win, played in front of 5,223 fans on The Farm. WSU trimmed an 11-point lead to two points with 1:10 to play and tied it at 84 when Robert Franks flushed a breakaway dunk after a Stanford turnover. But the Cougars put Daejon Davis on the foul line with 10 seconds to play and the freshman from Seattle knocked down two free throws. Flynn dribbled to the top of the arc, tried to shake KZ Okpala and launched his 3-point attempt over the forward’s arms with 3 seconds left. The Cougars could have swept the Bay Area schools for the first time since the 1992-93 season. WSU, after beating Cal on Thursday, settled for a split and dropped to 11-17, 3-13. Stanford improved to 16-13, 10-6 and kept itself in the hunt for a top-four seed at the Pac-12 Tournament in Las Vegas. On the one hand, the Cougars might view this as a squandered opportunity. They reached their season-high in points scored during a Pac-12 game (previously 83 at UCLA). They buried 34 of 60 shots from the field, or 56.7 percent, and nailed 11 of 23 from beyond the arc. But on the other hand, it won’t take a deep dig to find the silver lining. Two weeks ago, WSU lost at the Oregon schools by a combined 59 points. The Cougars have since won two of four and the losses, at home vs. Utah and at Stanford, came by a total of nine points. 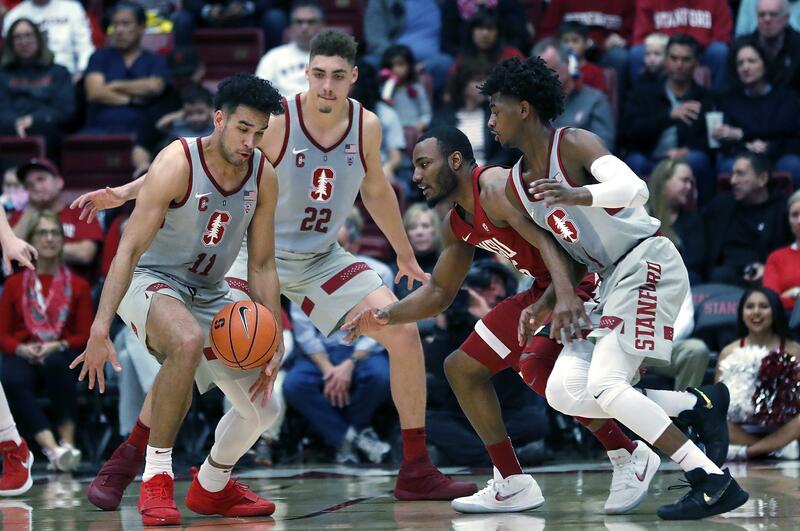 On a night Stanford was feting two seniors, celebrating the 20-year reunion of its Final Four team and scrapping for position within the conference standings, WSU pushed the Cardinal to their limit. For only the fourth time in Pac-12 play, but the second time in as many games, WSU managed to get four players into double figures. Franks led the pack with 19 points, Flynn and Drick Bernstine each had 16 and Milan Acquaah scored 10. Bernstine, a 6.3 ppg scorer, and Acquaah, a 4.4 ppg scorer, have especially been boosts to the offense in the Bay Area, combining to score 49 points against Cal and Stanford. Bernstine, a grad transfer from North Dakota, reached his WSU high in both games. The Cardinal were just a bit more powerful Saturday evening. Armed with one of the league’s most imposing big men, Reid Travis, Stanford scored 44 points in the paint and converted 31 of its 61 tries from the field. Travis scored 20 points and grabbed 11 rebounds, forward KZ Okpala added another 20 and senior forward Michael Humphrey scored 16 points and snared seven rebounds for the Cardinal. Published: Feb. 24, 2018, 7:56 p.m. Updated: Feb. 24, 2018, 8:38 p.m.